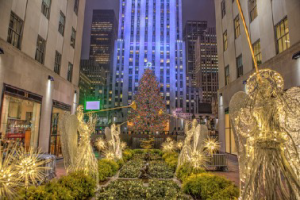 Rockefeller Center & Top of the Rock Observation Deck | Custom & Private New York Tours, Inc. Still, after 85 years Rockefeller Center is the centerpiece of “the city.” Sitting on 22 acres with 19 high rise buildings attract millions of visitors annually who enjoy many marvels of those urban planners and architects whose genius have created the pinnacle of urban planning genius. From the spectacular Christmas tree, as a symbol of its centerpiece of New York City, the embellishments of lavish art throughout, Radio City Music Hall, The Rink and The Promenade or “The Channel” all combine to top off the most wondrous urban complex ever.